The roaring wind whips my hair through the open window of the car. We’re driving through mountain peaks, somewhere in the land between states, that no-man’s land that defies borders. The people who live here use stilts to prop up ancient porches and mountain stone to rebuild their chimneys. They tend to refuse the authority of a state; tax them and they’re likely to die for the fourth time, arrest them only to find they never had an identity to begin with. Such are mountain people. A question rolls around in my mind as we jolt up the rutted road. How am I supposed to interview eight wands? “How am I supposed to interview eight wands?” I shout to my doppelganger. She gives me that beatific smile that means she has absolutely no clue what I just said. I grunt and look out the window to the peaks around us in the clear bright sun. Suddenly the car stops, and I see eight beautiful golden wands, as tall as myself, topped by elaborate finials twisting around in whorls. But they’re stuck in the narrow strip of grass beside the road, not flying through the air, the way they’re supposed to be. Is the image on the card wrong? My doppelganger gets out of the car, gets something from the trunk, and marches over to the wands. I can’t quite tell what she’s holding, but it’s taller than she is. She pulls a wand out of the ground and lifts it, holds it across the thing in her hand. 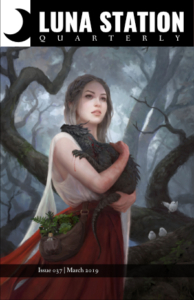 What she’s holding is a large bow. She draws back the string. If she lets go, that golden wand is going to go over the cliff and be lost forever. I leap from the car. She looks at me and grins. Twing. The wand soars. Seven left. “We’re here on business,” she says, mocking me with a fake-serious voice. She pulls another wand out of the ground. “You’re not supposed to speak.” She is mocking me again. She notches the second wand and draws back the string. She lets the second wand fly. Before I can stop her, she has the third wand in her bow. “What are you trying to do?” I demand. “Because you can’t waste space,” I say. She is right, of course. I’d been stuck, wondering why I even keep writing. Sometimes your well is dry, and the only thing that keeps you going is your commitment to finish the damn thing. The fifth wand flies. She draws the sixth, and speaks to me over her shoulder. “When an airplane takes off, that is a miracle. Many tons of metal rise into the air. What happens if the pilot doubts? If, in fear, he gives the takeoff anything less than full speed, if he feels that maybe he shouldn’t do this, and he hits the brakes a little on the runway, does the plane leave the ground?” The sixth wand flies. She lowers the bow to face me. “No, it does not. This is our inner selves. If we doubt, we are hitting those brakes, and the airplane of our creativity cannot take off. It can’t leave the ground.” She pulls the seventh wand from the dirt. I pull the last wand from the ground. I notch it, know I’m doing the right thing, and let go. I look up to the cloudless sky. 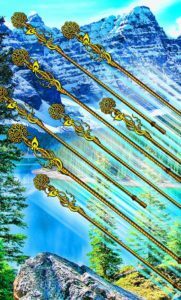 The eight wands hang there, exactly as they are pictured in every Eight of Wands in every Tarot deck I have ever seen. Shining gold, with the backdrop of endless mountain peaks beyond them, the crying eagles in their company, the clouds that pass over and through them: eight long wands, powerful, beautiful, irresistible. Eight golden wands, perfectly parallel to each other, soaring. The sunlight is full on them, and full on the trees below and far below and in the distance. The steep slopes around are full of life. The blue, crystal water is full of life. The wands themselves are full of life as well, driven by the pure urge to express the will upon creation. The higher the mountains they must cross, the better. The bigger the challenge, the greater the glory. The beauty is fierce and the power is great and my soul sings for what I have done. “Things aren’t supposed to stop mid-air,” I whisper.